Paeonia Gardenia starts as a pink bud, a bit blushy and shy, but, once in bloom, develops large, ivory white flowers that can grow 17 cm wide. In addition, it emits a marvellous fragrance. There’s a good reason why Gardenia is one of the most popular peony varieties on the market. Gardenia is a full-petalled peony with flowers in the shape of a rose. 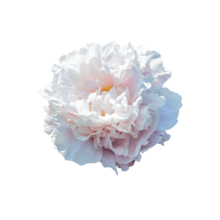 The outer petals are light pink and the inner petals, when fully bloomed, are ivory white. This combination of colours is also knows as blush white. This peony has strong, red stems and healthy leaves. This peony variety was bred in 1955 by Lins. Because of her sweet colour, Gardenia is extremely popular as a bridal peony. But also in a nice seasonal bouquet she will fit perfectly. Before putting Gardenia in lukewarm water cut the stems diagonally at the bottom . Cutting the stems diagonally allows for greater surface area and therefore a better water uptake.